Eighty percent of the 7,000 swimming pool drowning deaths that occur each year happen in backyard spas or pools. This figure does not include the number of swimming pool and spa poisonings, because sometimes owners overuse toxic cleaning chemicals, like chlorine and bromine. This figure also does not include the number of serious swimming pool drowning injuries, which according to some estimates, may be four times higher than the number of fatalities. A child can drown in the time it takes to answer the phone, and a child can have a serious allergic reaction to pool chemicals in the time it takes to hear the phone ring. Property owners have a duty of care of the victim was an invitee, which is someone who was invited onto the land and whose mere presence confers a benefit on the landowner. That benefit could be economic, such as a shopper or a job applicant, or noneconomic, such as a social guest. Property owner knows about this situation. Swimming pools and spas clearly meet this standard. In many instances, the reasonable person doctrine establishes the standard of care. For example, in car crash cases, reasonable drivers obey the speed limit, stop at stop signs, are sober, watch the road, and so on. The reasonable person rule is not entirely subjective, but it is sometimes difficult to pin down. 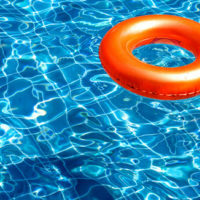 All pools must be surrounded by impenetrable fences or other barriers that are at least four feet high. Additionally, the barrier must be far enough away from the water that a child who climbed the fence could not fall into the pool. These barriers must have outward-opening gates with self-latching locks that are operable only from the inside of the fence. If part of a house or other structure constitutes part of the barrier, it must have no doors or windows that open to the pool area. Florida law also sets the standard of care in poisoning situations. For example, chlorine cannot exceed 10 parts per million and the pH balance must be between 7.2 and 7.8. To recover damages, victim/plaintiffs must establish a connection between the injury and the property defect. For example, if a child suffers chemical burns, the chlorine levels must be too high. Damages in these cases normally include compensation for economic losses, such as medical bills, and noneconomic losses, such as emotional distress. Backyard pool owners are usually responsible for the injuries that happen on their property. For a free consultation with an experienced personal injury lawyer in Brandon, contact Reed & Reed.